Getting paid $19,000 to spend 60 consecutive days in bed may sound like the stuff of dreams for some folks, but this is precisely what 24 people will be doing in an experiment designed by NASA and its European counterpart, ESA. Launched earlier this week at the German Aerospace Center (DLR) in Cologne, Germany, the study aims to learn more about the negative effects on the human body of prolonged periods of weightlessness — important if astronauts are ever to embark on long missions into deep space. Now, before you start wishing you were a part of this unusual study, it’s worth noting that the volunteers — 12 men and 12 women — will be kept in beds the whole time, with all experiments, meals, and leisure pursuits taking place lying flat with the bed angled downward toward the head end by six degrees. Ah, yes. Did we mention the spinning? Once a day, some of the study’s participants will be placed in a short-arm centrifuge and spun around to make their blood flow back toward their feet. 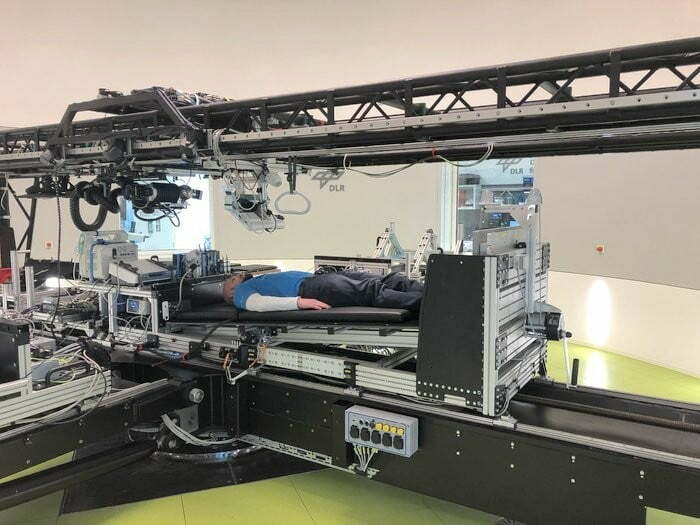 This will allow researchers to learn more about the potential of artificial gravity in combating the effects of prolonged weightlessness, which can lead to bone and muscle atrophy. “Currently, astronauts on board the International Space Station exercise for up to 2.5 hours per day and maintain a balanced diet to help mitigate microgravity’s effects, but scientists believe adding a dose of artificial gravity could be key during longer-term missions,” the ESA said. Other experiments conducted during the study will focus on areas such as cardiovascular function, balance, muscle strength, metabolism, and cognitive performance. Hansjörg Dittus, DLR executive board member for Space Research and Technology, said crewed spaceflight will continue to play a vital role in the exploration of our universe, but emphasized the importance of making it as safe as possible for the astronauts. While staying in a bed for two months straight may sound like the simplest of activities, the experiment is actually considered to be so demanding on the human body that all 24 individuals will be kept at the facility for a further 29 days to ensure a safe and healthy recovery. It’s fair to say they’ll probably need a good lie down after all that.